This article is part of a weeklong series analyzing the veteran experience in the United States, especially how returning veterans transition from the military to civilian life. WASHINGTON, D.C. -- Americans may understandably believe that the nation's veterans are suffering emotionally given news reports of high levels of post-traumatic stress disorder and other mood or anxiety disorders among those who have served in the military. However, Gallup finds that among employed Americans, active-duty and veteran populations are more emotionally resilient than their civilian counterparts. 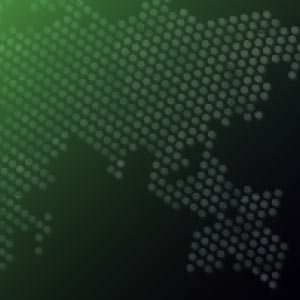 Gallup analyzed the responses of active-duty service members and working Americans who have served in the military -- including discharged veterans and retired veterans -- as well as civilians on a number of questions designed to assess emotional well-being, such as levels of stress and worry. The results are reported separately among 18- to 44-year-olds and 45- to 64-year-olds, given the strong relationship of age to emotional well-being, and the fact that a far greater number of older than younger Americans have served in the military. In terms of daily stress, active-duty service members aged 18 to 44 are least likely to report experiencing stress (39%) among working Americans in their age group, followed by retired veterans (42%), discharged veterans (46%), and civilians (46%). Stress is lower among older workers in each service group, with active-duty members aged 45 to 64 reporting the least stress of all subgroups, at 25%. The large majority of active-duty service members are 18 to 44 years old, but those who stay in the military longer and reach the 45-to-64 age group fare best in emotional well-being. 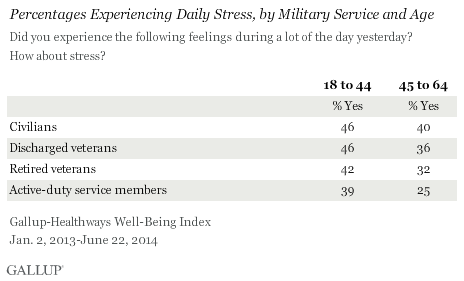 This suggests that those who serve the longest could be poised to have the least stress. Although younger civilians and younger discharged veterans report similar levels of stress, both civilian age groups generally report higher levels of stress than their veteran and active-duty counterparts. To many who have served in the military, this comes as no surprise, as military life braces its members for difficult adversities for which civilian life has no equivalent. "What do I have to worry about back in the civilian world? A missed report, a client I failed to sign? The penalties for failure to perform in combat are far more severe," says Gallup Senior Consultant David Goldich, a discharged veteran who served two tours in Iraq. "The military experience is defined by resilience. Your fellow troops are counting on you to perform under pressure at all times. Quitting is not an option." Retired veterans, those who receive full pension benefits after serving 20 or more years, tend to experience slightly less worry and stress than discharged veterans -- those who have not met the military's requirements for receiving pensions. Among those aged 45 to 64, 26% of discharged veterans experience worry daily, compared with 20% of retired veterans in the same age group. Retired veterans in this age group also report less stress (32%) than their discharged counterparts (36%). Discharged veterans do not complete the requirements for pension benefits for a variety of reasons, many of which are self-elected. For retired veterans, the benefits are wide in scope, including significantly less expensive healthcare, and this can make retired life much more comfortable. Although many veterans face very serious and unique mental health challenges, that does not seem to be the experience of most of the veteran community, which in fact fares better than working civilians in many aspects of emotional well-being. According to the Department of Veterans Affairs, about 7% of civilians have PTSD in their lifetime, while the percentage ranges from 11% to 20% for veterans who served in the early years of the current conflicts in Afghanistan and Iraq. The VA also reports that as of 2010, more than half of veterans who sought mental healthcare (53%) had problems related to PTSD, and that more than a third (38%) suffered from depression. On the whole, however, veterans appear more emotionally resilient than the general civilian population. As the nation works to find employment for returning veterans after two wars, it's important not to view veterans as emotionally scarred or damaged. They are, in fact, a lot more emotionally sound than those who have never served. Reasons for this may include the military attracting people more emotionally sound to begin with, or there may be an emotional benefit directly related to military service. Results are based on telephone interviews conducted as part of the Gallup-Healthways Well-Being Index survey Jan. 2, 2013-June 22, 2014, with a random sample of 128,285 adults, aged 18 and older, living in all 50 U.S. states and the District of Columbia. For results based on the total sample of national adults, the margin of sampling error is ±0.25 percentage points at the 95% confidence level. Americans oppose direct U.S. military action in Iraq to support the fight against Islamic militants there, 54% to 39%. This level of support is low compared with other recent potential U.S. military actions.